Emmanuel Community (Fort Wayne, Ind.). 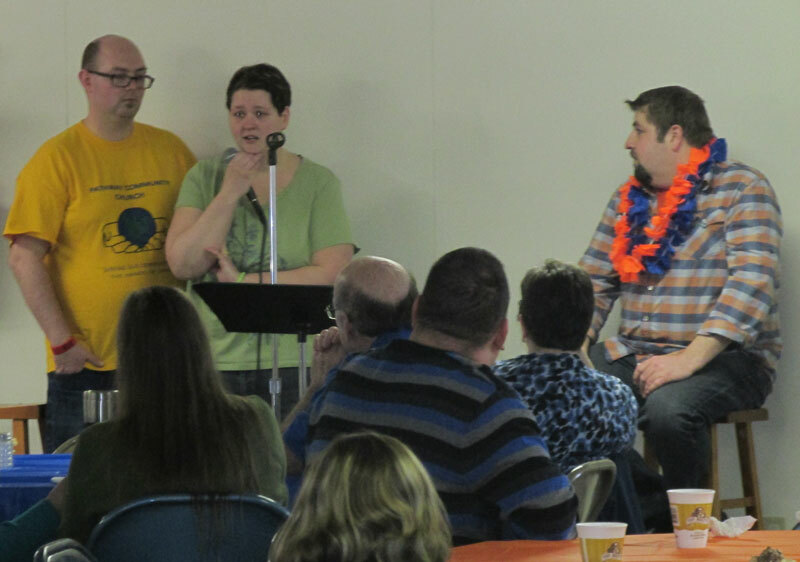 The group will meet up with Global Ministries staff Bryan and Emily Gerlach, who are serving in Thailand, and with two persons from Hong Kong Conference: Superintendent Yiu Kin Keung and conference missions director Carol Chan. Bishop Phil Whipple issued a challenge to United Brethren ministers–to fill out an NCAA March Madness bracket in a special group for UB ministers on ESPN.com. A total of 68 people–mostly ministers, with a few missionaries and national office staff thrown in–signed on. After the first two rounds, and as we begin the Sweet 16, the lone leader is Jim Bolich, senior pastor of Prince Street UB church in Shippensburg, Pa. Tied for second place are Donna Hollopeter, associate director of Global Ministries; and Kevin Poole, Children’s Pastor at Fowlerville UB church (Fowlerville, Mich.). Scott Stephens, director of Camp Cotubic (Bellefontaine, Ohio), provided this update on Tuesday about his father, retired UB minister Dave Stephens (right). “Dad was admitted into the hospital at Ohio State and is still there. He had gone in on Monday for his last radiation treatment on his hip when his doctor became concerned with his skin and eye coloring. Changing or yellowing of the skin and eyes is a sign of issues in the liver, which the doctor had told us we’d need to keep an eye on throughout chemo treatments. They did a CT scan today (Tuesday) and are going to do an MRI late tonight looking at his liver. We should know the results in the morning. You can also leave a note on his Facebook page. A car load of United Brethren pastors from El Copan, the western region of Honduras, was traveling to a cluster meeting last Saturday evening (March 22) when their car left the road and rolled. The passengers suffered cuts, bruises and some broken bones, but all survived. The car was written off. Superintendent Juanita Chavez is praising the Lord for protecting them, but also asks for our prayers. 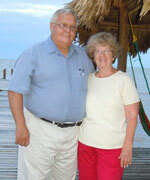 We’re asking for prayer for Darlene Eberly, a former missionary in Sierra Leone with her husband, Bob. Darlene had been treated for melanoma, but it has now returned in an aggressive fashion. She has begun radiation, and will have another biopsy in the next couple days. It’s a very serious situation. Bob and Darlene Eberly are members of Otterbein UB church in Greencastle, Pa.
Their daughter, Brenda Moore, and her husband Chris, an ordained UB minister, are endorsed staff with Global Ministries; they serve with Here’s Hope Ministries, which operates in Belize and several other countries. 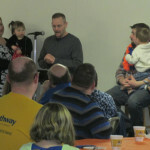 Bob Eberly is founder and president of Here’s Hope Ministries. At the McCallum water table. One of the more interesting bicyclists who stopped at the church. 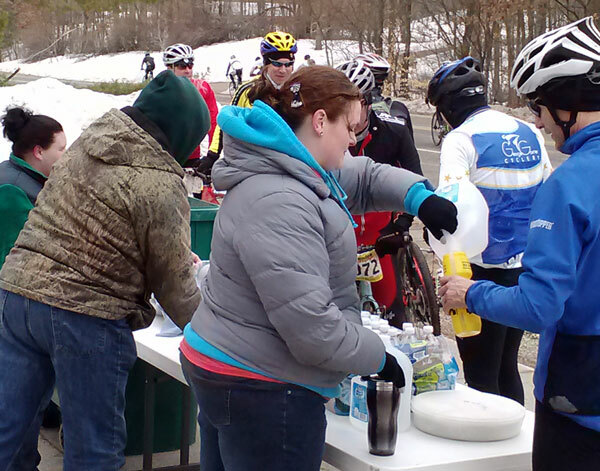 On Saturday, March 22, the folks at McCallum provided peanut butter and jelly sandwiches and water to the participants of the Barry-Roubaix Killer Gravel Road Race, the largest gravel road bicycle race in the USA. The race consisted of three courses–62 miles, 36 miles, and 24 miles. 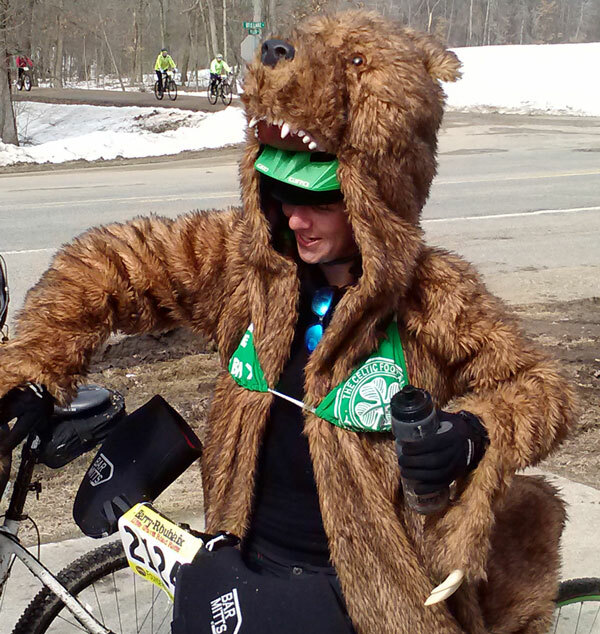 Both the 62-mile and 36-mile passed in front of the church, giving the brave souls of the congregation opportunity to cheer the riders on and offer refreshments, bathroom facilities, and a place to warm up if desired. Ladies of the Women’s Missionary Fellowship came early and made up 180 PB&J sandwiches. Eight gallons of bulk water was given to fill water bottles of the riders, plus bottled water was available as well. Rev. Mike Brown, pastor of Franklin UB church (New Albany, Ohio), is mourning the death of his mother. Pearl Buck passed away March 20, 2014, in Columbus, Ohio. Funeral: Monday, March 24, 11 am. Visitation and funeral location: Rader-McDonald Funeral Home, 1355 W Main, West Jefferson, Ohio. The Horizon Scholarship recipients. L-r: Allison Amstutz, Jessica Bombino, Leah Ness, Hannah Priskorn, and Selina Poh. Five incoming Huntington University freshmen have been awarded the Horizon Leadership Scholarship for the 2014-2015 academic year. Allison Amstutz, of Berne, Ind., plans to major in nursing. 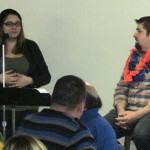 Jessica Bombino, of St. John, Ind., plans to be a youth ministries major. Leah Ness, of Huntington, Ind., plans to study accounting. Hannah Priskorn, of Auburn, Ind., plans to be a psychology major. Selina Pohl, of Lansing, Mich., plans to be a nursing major. A collaboration between Huntington University and Youth for Christ, the Horizon Leadership Scholarship was begun in 2008 to attract and retain students of diverse racial and ethnic backgrounds. The scholarship covers the recipient’s tuition and room-and-board for up to 10 semesters. This is made possible through a blend of federal, state, and institutional aid. Recipients are required to achieve and uphold a standard of academic performance, community service, and spiritual and social growth. Brent Liechty (left) speaking as other gather around Scott Hardaway. 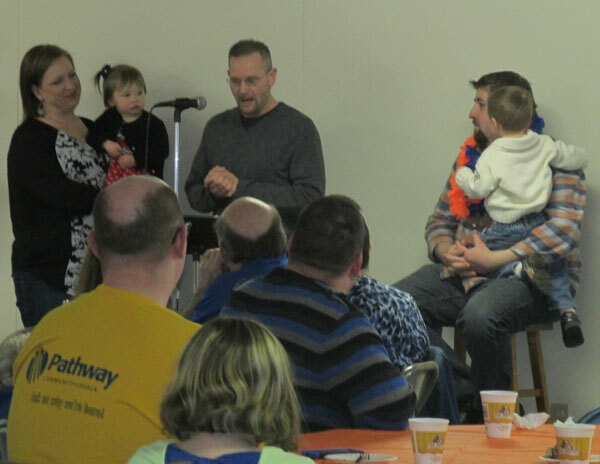 On Sunday, March 16, Pathway Community Church paid tribute to its former pastor, Scott Hardaway. Todd Fetters, director of National Ministries, came to speak and kick-off our new series, “All For Christ.” He did an excellent job. 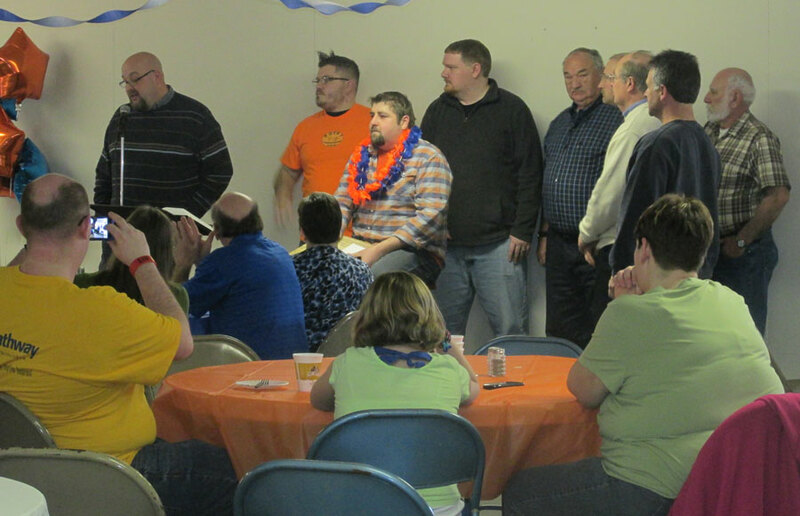 Then we had a special lunch to honor Scott Hardaway, who was the senior pastor here from 2005 to November 2013. In October 2012, Scott’s wife, Tanya, passed away soon after being diagnosed with cancer. Scott realized he could no longer be both a single dad and a pastor, so he resigned. 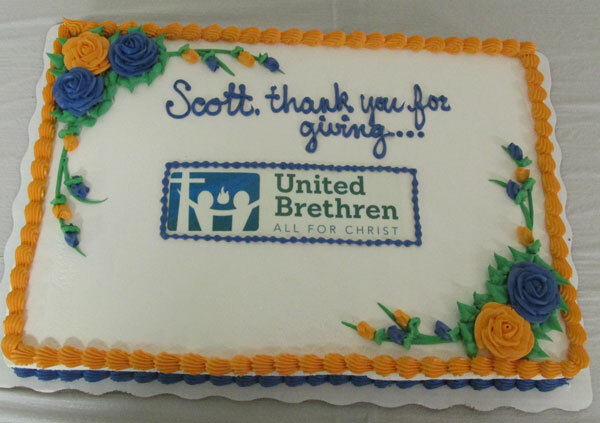 Pastor Scott worked hard to lead with integrity and passion, and to love the congregation to become All For Christ. 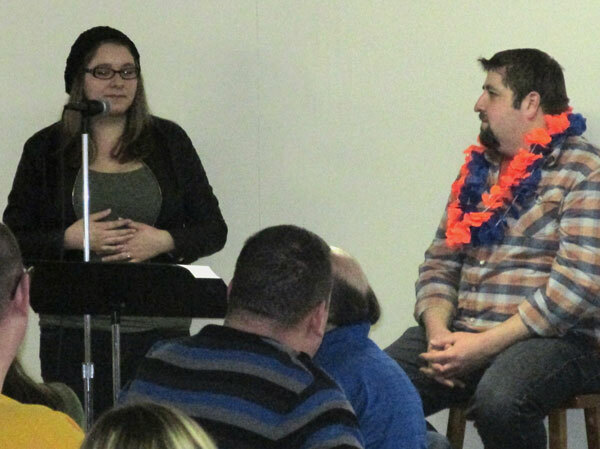 Many people shared stories of how their lives were changed through Scott’s time here at PCC. He was presented a scrapbook filled with pages from people within our church, with pictures, letters, and more stories for him to remember his time with us fondly. We finished by having past and present elders lay hands on Scott and pray over him. Scott is currently working towards a paralegal degree at Baker College, and will take his two boys to summer with his parents in Washington State. 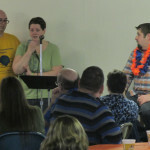 I’m very proud to have worked with Scott as his associate pastor. We were a good team. He has changed me for the better in so many ways. 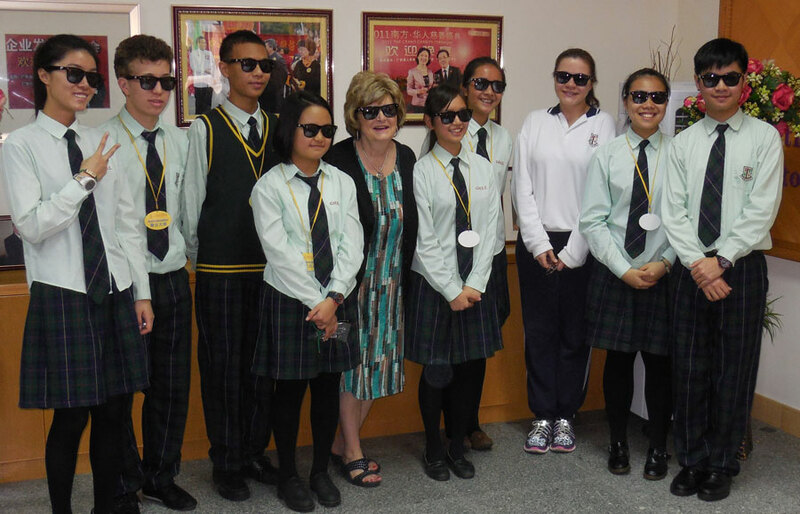 Dr. Emberton with student ambassadors at China Hong Kong English School posing with their cool Huntington University sunglasses. Dr. Sherilyn Emberton with Mr. Tang Ying, standing committee member of Zhongshan, and Dr. Jonathon K. C. Chai, director of China Hong Kong English School. 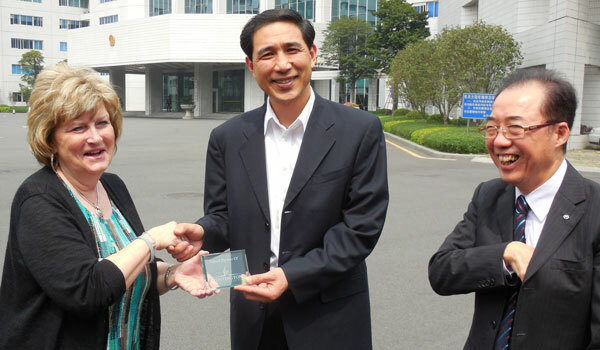 They discussed opportunities for educational partnerships in Zhongshan. 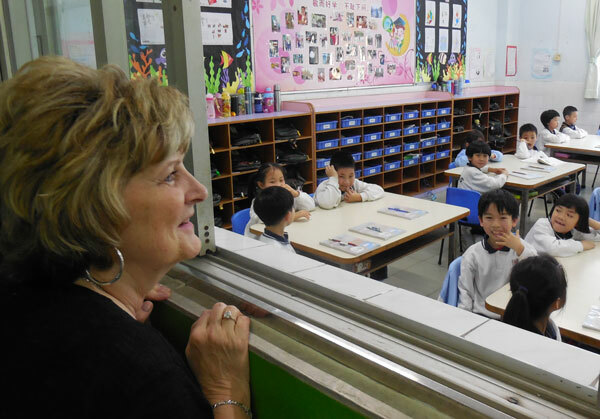 Dr. Emberton looks in on students at China Hong Kong English School in Jiangmen. Dr. Sherilyn Emberton, president of Huntington University, was in Hong Kong on Wednesday meeting with people from the China Hong Kong English School. Here are a few photos. Dr. Emberton is traveling with Dr. Luke Fetters and Shoshannah McKinney. Read more about the trip here.